Have you ever heard about mindfulness? I bet you have. Repeatedly, and from all sorts of sources. Unless you’ve lived under a stone (or you’re not into meditation, psychology or self-help), you might have noticed that mindfulness has become fashionable, and that everyone from firemen to executives and school kids are practicing it these days. 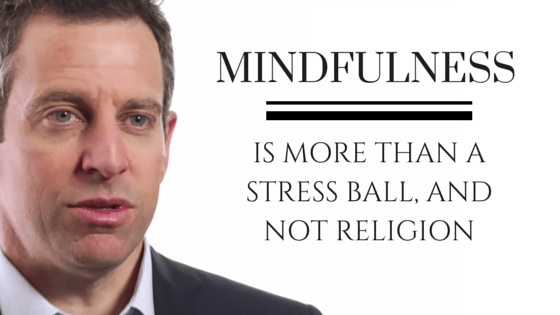 This mindfulness talk by Sam Harris and BigThink talks about just that, and adds that mindfulness should be something we teach and cultivate from a non-religious standpoint. I loved every word of the talk, and Sam manages to pack a whole lot of content into just 7 minutes of video. He goes on to elaborate on that, the fact that “most of us spend every moment of our waking lives thinking without knowing that we’re thinking”, and the effect the thoughts have on us and how it distorts our experience and view of life. Sam then talks about how most mindfulness teachers are teaching from a religious background, and why that is wrong in the long run. I encourage you to listen to the whole talk yourself, and see if you agree with what he is saying. Please comment below, and don’t forget to share!